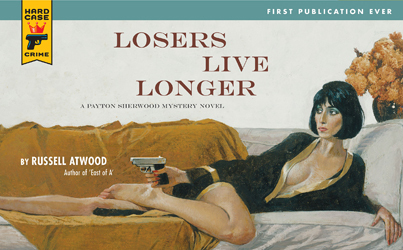 Booklist on LOSERS LIVE LONGER: "Entertaining...Atwood’s charming subversion of the genre is great fun." Publishers Weekly on LOSERS LIVE LONGER: "[A] modernized crime tale...of a PI who cares more about honor and truth than money." "[Atwood’s] place descriptions are clearly, even beautifully, focused, and his tawdry locales are inhabited by characters who are not only fascinating to study but also real enough to look back at you." "Impressive...Atwood takes the rusty private eye novel and oils it and gives it new charm and a fresh look." "Establishes a new category of suspense fiction: downtown noir. Atwood definitely has his finger on the pulse of the city that never sleeps."